FatCow Review 2019: Is FatCow a Good Hosting? FatCow is an “old school” hosting company that focuses on making it easy for small and mid-sized business to get online. However, if you need a more advanced solution such as VPS or a dedicated server, they can fit that need as well. Flat annual pricing makes them attractive to startups looking to save money. 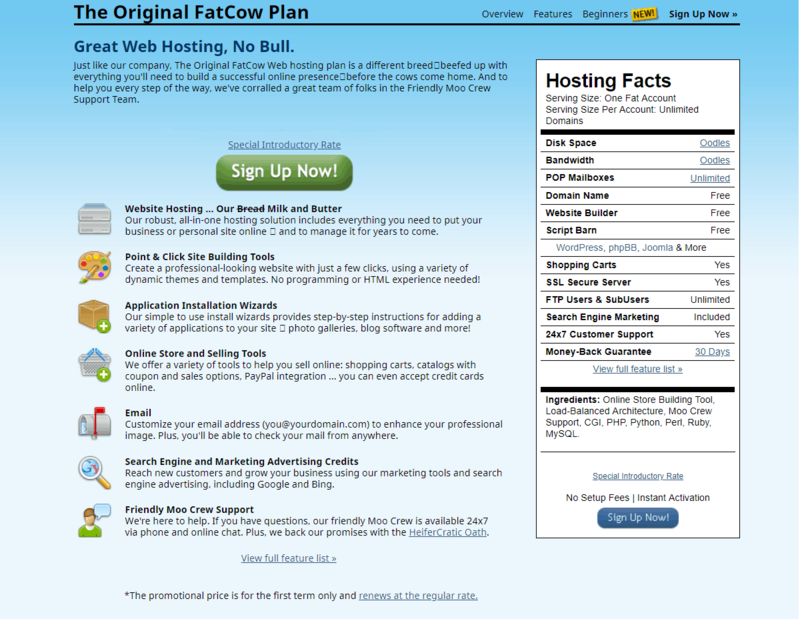 FatCow is one of the oldest web hosting companies on the internet, first opening in 1998. They are a U.S.-based company whose primary focus is providing affordable web solutions to small to mid-sized businesses. Having been around through much of the internet revolution, FatCow has always maintained a hosting service that is both robust yet easy to use regardless of one’s technical ability. Note that for unmetered disk space and bandwidth, you are bound to the TOS which states that FatCow can throttle your site’s connection speed and memory allocation if you’re using too much bandwidth or storage. FatCow has a relatively impressive list of advanced features. All of these features come standard where some services only offer them in their top plans or not at all. FatCow offers point & click web builder tools with customizable templates along with automatic setup scripts for WordPress and Joomla. Their cPanel is easy to navigate, and with FTP access standard, more advanced webmasters can quickly build a site without being restricted to using beginner tools. Original FatCow – This is their main individual plan that allows you to set up unlimited domains. This is great for most any site from webstores to blogs and more. It also includes unlimited email addresses, an SSL secure server, and more. WordPress Hosting – If you plan to build a site using WordPress, FatCow also offers WP hosting that includes a customized control panel and pre-installed themes & plugins. They also provide a second-tier WP hosting that includes faster speed servers, enhanced security, and support from WP experts. VPS Servers – If you’d rather have full control over your website and need features like a dedicated IP address, you might consider one of FatCow’s VPN server options. This is for those users who know how to design and update their site and want to be on less crowded servers. Dedicated Servers – For those needing their own server or have sites that are outgrowing shared hosting solutions, a dedicated server is ideal. Their plans include servers with 4GB to 16GB of ram, up to 1TB of storage, and up to 15TB of bandwidth. You also have from three to five dedicated IP addresses. For those looking to set up their first site and worried about tech skills, I’d choose the WordPress Hosting plan, It’s great for absolute beginners, and the plan offers all of the same features as Original FatCow, but in an easy-to-use interface. One thing that I really like about their Original FatCow plan is that they have a flat annual pricing option. Also, all their plans come with a 30-day money back guarantee, so there’s no risk involved. FatCow’s customer support is available 24/7 and offers multiple options to answer your questions. Their Knowledge Base is fantastic and very comprehensive to answer both basic and more advanced questions. If you need additional help, they offer toll-free phone support and live chat assistance. I tried contacting customer support and was able to connect to an agent in about five seconds and the agent was very knowledgeable about my issue. However, it was clear he was not a native English speaker, so you may want to clearly communicate any problems when talking to them. FatCow web hosting may look a bit simplistic compared to other services, but it is deceptively powerful. Their service is excellent for beginners and experienced webmasters alike. Wondering how FatCow stacks up against other Web Hosting companies? Enter any other Web Hosting company and we will give you a side-by-side comparison.